My Very Own Lifetime Movie: Forced Family Fun! Our family is way too busy...well, Rick and I are way too busy. Rick is of course working full time, but he also goes to school part time and has a part time weekend job. I'm in school full time and studying is my job, so it's not often that we have one day, let alone three days, to be together uninterrupted. But last weekend was just that. I named it Forced Family Fun. We were gonna be together and we were gonna like it. Nay, LOVE it. Glory be, it worked! Who knew? Friday night we left Aren and Tatiana at home and Rick and I went out to dinner and then I finally upgraded my phone. Did you know they have phones where you can take decent pictures AND check your facebook status? Yeah, I know. I'm a little behind the times, but my phone is amaze-balls. Saturday we divided and conquered. Rick and Aren hung out and went to a churchy thing then out to dinner while Tatiana and I stayed home and watched whatever cartoon we could find from Redbox. It wasn't good. Seriously, a dollar I will never get back. 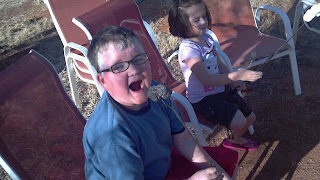 Aren likes his marshmallow nice and charred! Sunday was fantastic. 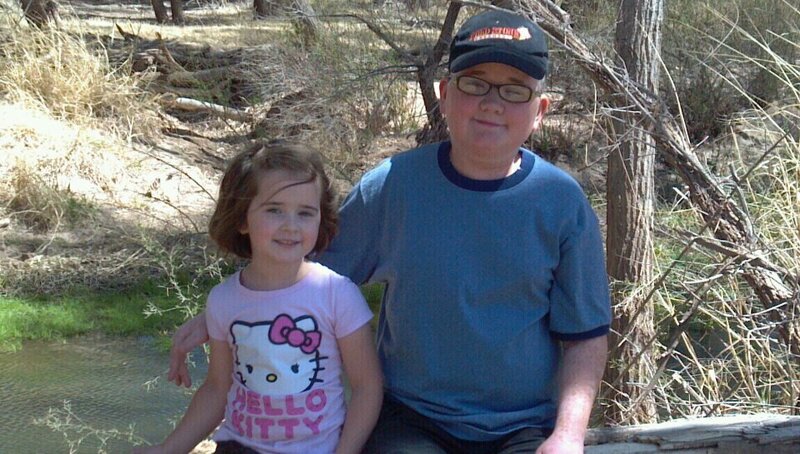 We went to the San Pedro house and went on a little hike complete with a picnic by a pond. Complaints were few and far between. In fact, Aren wanted to keep going! We came home and roasted marshmallows and hot dogs for dinner. Showers were had without complaints and children went to bed on time and happily. If I didn't know better I'd say we were being duped, that's how perfect the weekend was! Reality will set in this week as I'm studying for anatomy and Rick does nothing but work and plays a little Paper Mario World for Tatiana as she doses off to sleep, but we'll remember fondly our weekend of forced family fun and how it was a success!